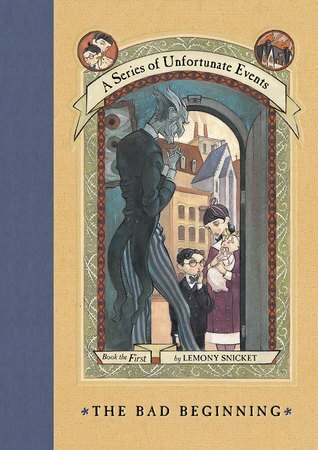 Ever since I first saw the movie, A Series of Unfortunate Events, with Jim Carrey playing Count Olaf, I knew I had to read the books. Since then I have been slowly collecting used copies of the books and awaiting the day when I had them all and could open up the pages of the first book, The Bad Beginning. With the introduction of the new A Series of Unfortunate Events show on Netflix, starring Neil Patrick Harris, my daughter has become obsessed with Count Olaf and the Baudelaire children. She has watched and rewatched both the movie and the show so many times that I have lost count and is constantly asking for more Count Olaf. And thus, the day I got to beam in pride at being a bookish mom finally came around. My three year old loves books and it made her day when I pulled out book one in the Unfortunate series. She saw the cover and immediately recognized Olaf, Sunny, Klaus, and Violet and couldn't wait until bedtime when we would dig in. At around a chapter a night, we finished the book pretty quickly and, considering the movie and show didn't change much, there was no question on whether or not we loved the book. Being a mom that loves knowing big words and finding ways to work them into my everyday conversation, I absolutely LOVE that a book geared towards youngsters has such an abundance of large vocabulary and doesn't try to dumb it down for the younger readers. In fact, the book does it's best to TEACH the large words found inside it's pages and I am insanely impressed by that.